In recognition of Human Rights Day on Dec. 10, Chinese blind, legal activist Chen Guangcheng videotaped a message in advance, with the New York night skyline in the background. The tape was released Dec. 3 by ChinaAid, a Christian human rights organization that promotes religious freedom and the rule of law in China. In the 10-minute video, Chen says the Chinese Communist Party is corrupt and lawless, calling upon newly installed General Secretary of the CCP Xi Jinping, to change the course of China toward the rule of law and human rights. “Dear Mr. Xi Jinping, the whole nation is watching you. Whether you will follow the call of heaven and the people to carry out reform, or kidnap the government and maintain the power of the Communist Party, it is a matter of whether China will transition in a peaceful or violent way,” he said. Chen urges Xi not to support the practice of treating Chinese citizens who advocate that officials should obey the law as state enemies. “Do not send the signal to [Communist] Party officials that they can continue acting without any restraint,” he said. He listed many well-known activists, dissidents, intellectuals, and rights attorneys who have been harassed, detained, and in some cases beaten and imprisoned, including Liu Xia, Hu Jia, Wang Lihong, Jiang Tianyong, Xu Zhiyong, Zheng Enchong, Feng Zhenghu, Liu Ping, and Sun Wenguang. Chen refers to Burma’s leader Thein Sein who he said released 518 political prisoners. If he could free Aung San Suu Kyi and other Burmese dissidents, why can’t Xi Jinping free Gao Zhisheng and other prisoners of conscience, he asked. “Unfortunately, human rights in China are in fact getting worse,” Chen said. Chen, 41, is a self-taught legal activist, who has been active since 1996, providing legal advice to people with disabilities, villagers fighting toxic waste, and peasants resisting the confiscation of their lands. He is best known for challenging the Communist Party’s one-child policy. Chen collected testimonies of villages in Shandong Province who had been forcibly sterilized, or forced to have abortions even in the seventh and eighth month of pregnancy. Chen exposed 130,000 forced abortions that took place in one year in Shandong. His work against the Linyi Family Planning Commission led to the punishment of local family planning officials by central authorities. The former retaliated against Chen and eventually had him imprisoned for over four years. 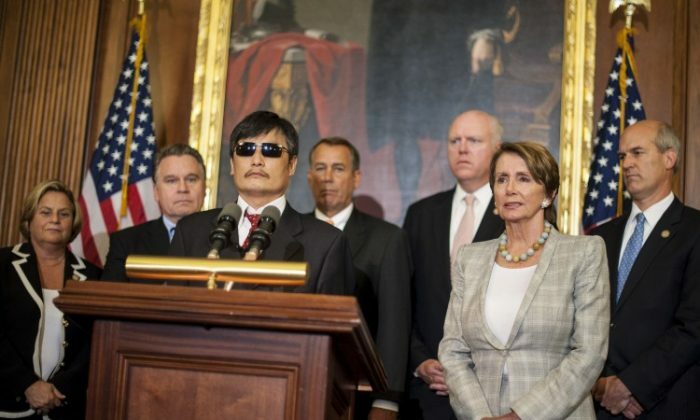 After he was released, Chen, his wife, and daughter were illegally placed under house arrest. Chen escaped house arrest in April and eventually took refuge in the U.S. Embassy in Beijing. U.S. officials negotiated with Chinese officials to allow Chen and his family to leave China and come to the United States to study law at New York University. During the negotiations between the United States and People’s Republic of China (PRC) officials when Chen was in the American Embassy, an understanding was reached that the government would investigate the illegal actions taken against Chen and his family. When Chen came to United States in May to study law at New York University, he enjoyed living in a free and safe country in marked contrast to the PRC. Though relieved to be able to take a rest with his wife and two children away from the repressive environment, he worried about retaliation against his family back at his home in Linyi City, Shandong Province, and the people who helped him escape from house arrest. Chen’s worse fears were realized recently. Chen’s nephew, Chen Kegui, 33, was sentenced to 39 months in prison on Nov. 30, in a trial fraught with glaring procedural violations. He was not permitted to be defended by the counsel his family had hired; a court appointed lawyer was imposed instead. The blind activist’s brother (father of Chen Kegui) was notified of the trial late in the morning on the day of the trial. The father was not permitted to attend the court proceedings, and waited outside the court, according to the Washington Post. The court proceedings were closed to the public. 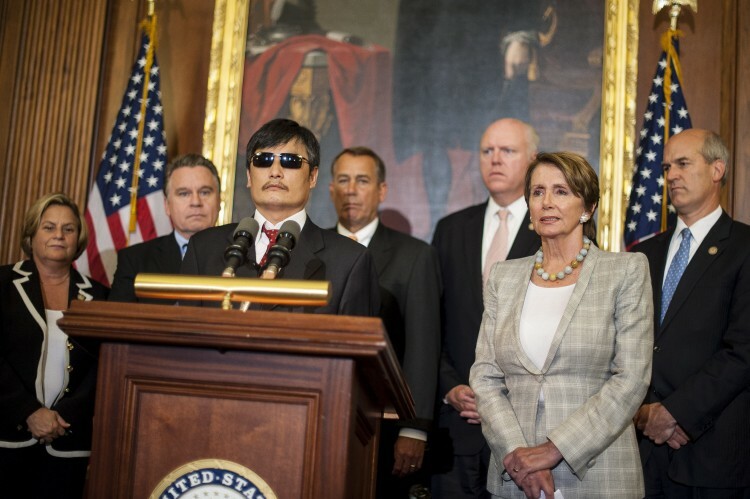 Chen Kegui was the easiest target for local authorities to exact their revenge on Chen Guangcheng for his escape. When in the middle of the night, authorities looking for Chen’s uncle, broke into his nephew’s home and attacked his parents, young Chen used a kitchen knife to ward them off, and cut one of them. He was charged with injuring a government official.